InfoDots™ as your solution will not tax your budget or your staff. The InfoDot™ is proof that size doesn’t matter. This label uses DataMatrix ECC200 bar code to encode as much data as a traditional bar code while taking up only one-tenth the space – making the InfoDot™ the ideal identification solution for small parts tracking. The InfoDot™ resists solvents, caustics, acids, and temperatures of nearly 500 F. The InfoDot™ also discourages theft or tampering and is non-transferable. 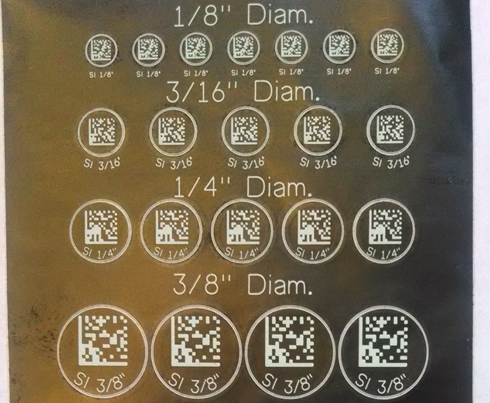 Plus, because of the high redundancy within the DataMatrix ECC200 Bar Code Symbology, the InfoDot™ is still readable when as much as 60% of the image is damaged. Contact us to review a sample sheet of our InfoDot™ sizes. InfoDots™ come in four sizes. Custom sizes can be quoted for your application. 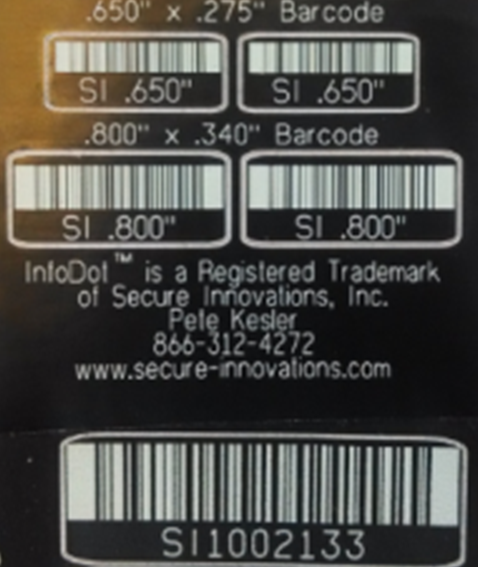 In addition to our radial InfoDots™ we produce several lineal barcodes in the same tested and proven material in various lineal code 128 sizes. While we stock several standard sizes including .650; .850; 1.0; 1.25 and 1.50 inch we can also produce custom sizes to meet your needs.